Dr. Ansari completed his Ph.D. at the age of 28 years from Kanpur University and conducted postdoctoral studies from University of Nebraska Medical Center, University of Pittsburgh and Case Western Reserve University. Dr. Ansari has published more than 25 peer-reviewed articles in reputed journals and presented his work in several meeting. 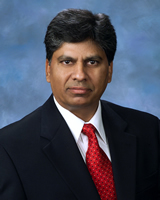 Dr. Ansari serves as a reviewer for several journals and also is editorial board member for few journals. His research focus is on defining the role of environmental factors in regulation of human angiotensinogen gene. Dr. Ansari's research focus is on defining the role of environmental factors in regulation of human angiotensinogen gene, including Hypertension, Angiotensinogen, Alcohol, Environmental Factors and Cardiovascular diseases.